Egg Wars! 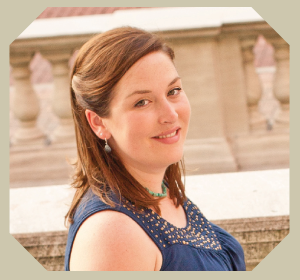 (Creamy Herb Deviled Eggs Recipe) | Krystal cooks. For Easter this year we went down to Southern Wisconsin, where my parents live. It is a long drive, compounded by traveling with a baby and two dogs. It was definitely worth it though. 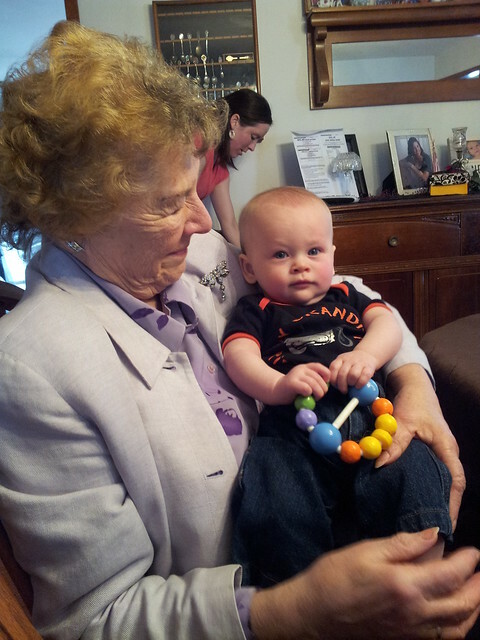 We had a blast seeing all of my family and catching up. Though Little K ended up getting two top teeth (yay for balancing out his smile!) and a terrible fever along with them, we did come home with some pretty fun goodies. 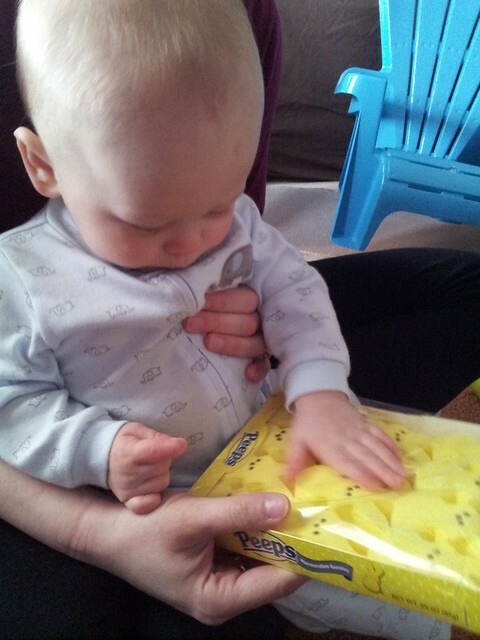 Little K got some fun toys from the Easter Bunny and his very own adirondack chair. 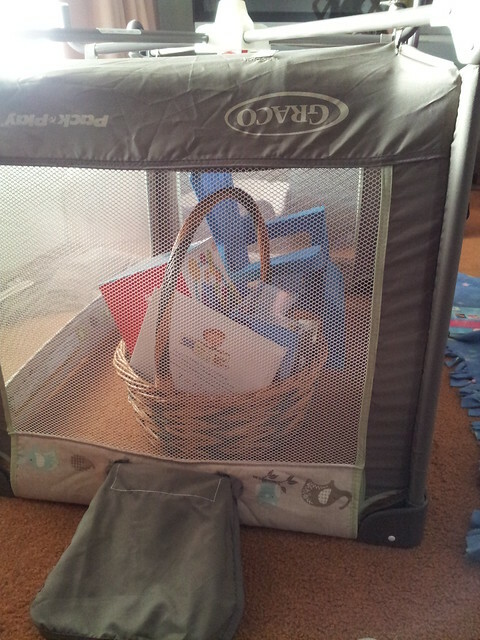 Silly bunny hid Little K’s basket under his pack and play! Do you decorate your eggs as intricately as this? 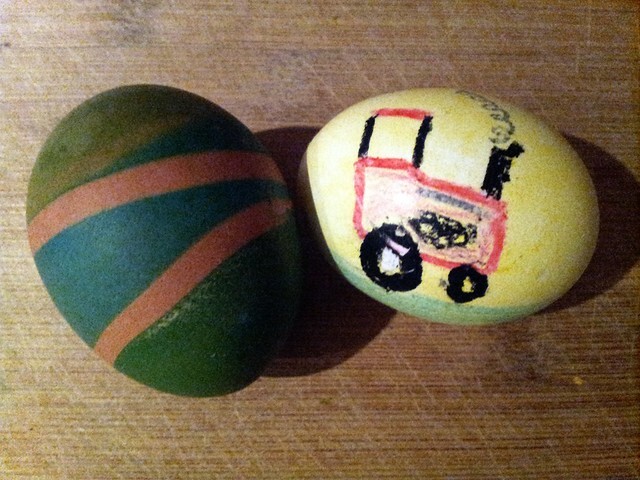 That’s Little K’s egg (Rachel’s handiwork) with the big red tractor. 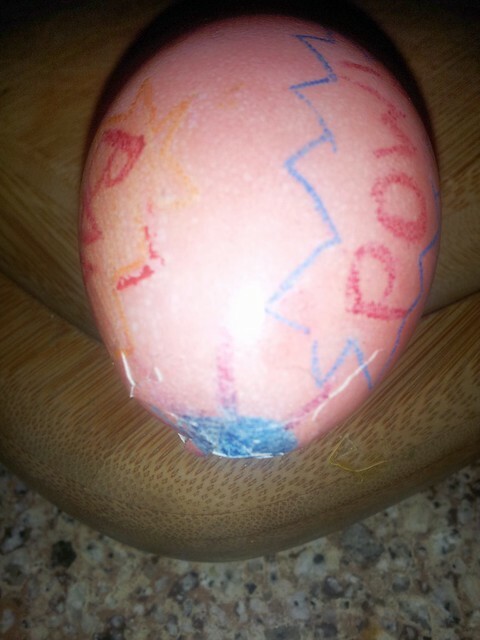 We decorate eggs every year. And we’re serious about this project. This year we decorated seven dozen eggs. Don’t worry, only a mild cholesterol spike for us, each family only took about a dozen home. What does any sane person do with all those eggs? Well, first you have an egg war. 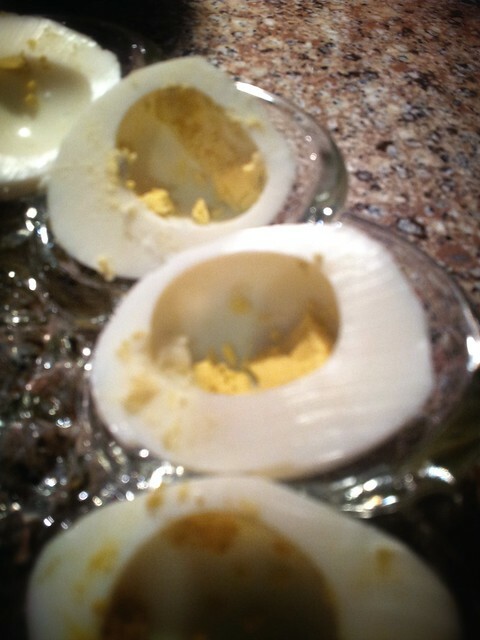 After a couple eggs have sparred one another and been defeated, you make deviled eggs. What other option did I have?! Deviled eggs are always a teeny bit annoying to prepare. Half the time I mangle the egg white while getting the yolk out. Don’t stress out too much if the yolk doesn’t come out cleanly though, once you put the filling back in no one will notice. 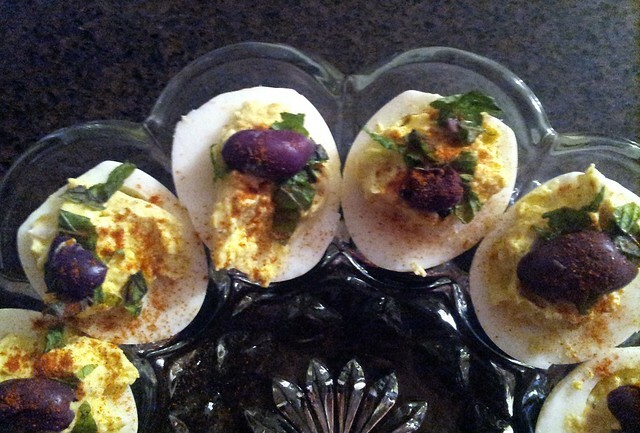 Basically though, the process to make these is the same as preparing traditional deviled eggs. Twenty-four. That’s how many this recipe serves. I made deviled eggs for Easter dinner for my immediate family of six, plus five more people from my Mom’s side. And even for that many people I only made enough to serve twelve. So you can imagine my irritation when I got this recipe out to make for just E and I. I made it for six (three eggs) and just ended up eyeballing most of the measurements since it was kind of a pain to do the conversions. I also find it frustrating that they offered a “tip” in the magazine, but they don’t include that tip on the website. I didn’t like the flavor in these at all. The Greek yogurt gave it a strange taste. I think I might try it again with a bit of cucumber stuck in the top (no mint or lemon next time). I think the fresh crunch might help a bit. These are super healthy and a great protein boost, though. If you don’t have Easter eggs to use up, like I did, then you have to boil your eggs and clean up after that. 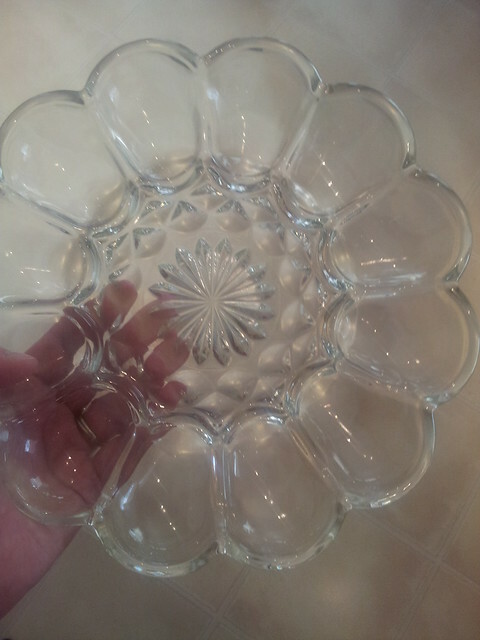 Otherwise it’s just a bowl to make the filling and a plate to serve them on. 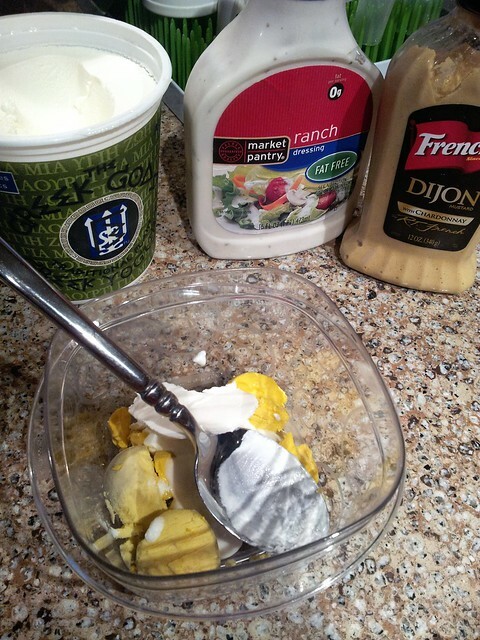 It’s essentially the same clean up as you’d have with traditional deviled eggs. An easy enough recipe to shop for, nothing expensive and you probably have most of it on hand. What did you do for Easter? Do you have egg wars at your house? I never know what to do with all the eggs besides deviled eggs and egg salad. Any suggestions?